After all the talk of the Devin White controversy, how Alabama hadn’t played anybody and fans celebrating the fact that national media almost unanimously picked the Crimson Tide to defeat LSU so the Tigers could prove them wrong, one thing came abundantly clear as Saturday’s game progressed. Alabama is exactly who it and everybody said it was, and Devin White’s absence in the first half should have been the least of LSU’s worries. There was no sign that Alabama quarterback Tua Tagovailoa cracked under the pressure of the game or the loud noise in Tiger Stadium, the defense didn’t get on the board and swing momentum and, if anything, Alabama’s defense looked as stout as it ever has. LSU head coach Ed Orgeron put it best in his post-game presser when asked if Alabama had any weaknesses. Tagovailoa entered the game as the Heisman Trophy frontrunner and left Tiger Stadium as close to a guaranteed winner of the award as someone can be more than a month out from the award presentation. In what was his worst performance of the season, he completed 25 of 42 passes for 295 yards and two touchdowns with his first interception of the season. A big question in the two weeks of anticipation leading up to the game, a big question surrounded Tagovailoa and how he would handle the raucous crowd of Tiger Stadium and the stakes of the game. 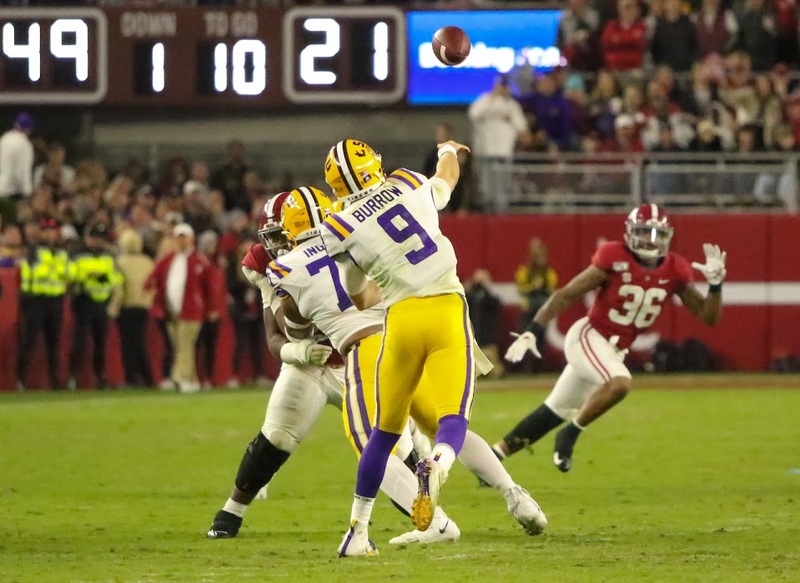 Answered with “just fine,” as he and the Alabama offense slowly chipped away at LSU’s defense and slowly – but surely – put the game out of LSU’s reach. The questions about LSU’s pass rush turned out to be irrelevant as well. At least twice in the first half, it looked like LSU’s front seven had Tagovailoa dead to rights, only for him to not only get a pass off, but to a receiver, sometimes in coverage. One such play came on third down in the red zone. Tagovailoa was on his way down to the ground when he found Josh Jacobs down the sideline just in front of the first-down marker, allowing the Tide to go for it and convert on fourth down to extend the drive. The only time Alabama’s offense really went backward was on the first drive of the game when the crowd got an assist for what turned out to be a stop thanks to some loud noise that caused some confusion on the offensive line. Two false start penalties pushed Alabama out of field goal range and forced it to punt. But from there, Alabama elected to start using visual cues on its line in place of verbal cues, and the Tide didn’t seem to have a problem after that. By the time the clock hit 0:00, the Tide averaged 7.0 yards per pass attempt and 7.6 yards per rush for a total average of 7.3 yards per offensive play. Another big question entering the No. 1 vs. No. 3 showdown whether Joe Burrow could exploit some of Alabama’s weaknesses in the secondary. Unfortunately for Burrow and the rest of the LSU faithful, he didn’t get many opportunities to attack the Alabama secondary as he spent a majority of the game running or his life. The Crimson Tide’s front seven have LSU’s offensive line no mercy as it burst its way through the Tigers’ protection on play after play. Burrow never felt comfortable in the pocket, forcing him to flee and try to make something happen with his feat. He was sacked five times for a total of 29 yards and finished the game with minus-7 rushing yards on 12 carries. LSU’s usually-reliable duo of running backs Nick Brossette and Clyde Edwards-Helaire had little luck, either. Brossette went for just five yards on seven carries while Edwards-Helaire netted 14 rushing yards on six carries. Edwards-Helaire had a couple exciting moments with a significant kickoff return that put LSU near midfield and a screen pass that went for 30 yards, but the Tigers continued to stall on offense once it crossed the 50 yard line. Alabama defensive tackle Quennin Williams had his way with LSU’s interior offensive line, pushing through for 10 tackles, 2.5 sacks for 18 yards and 3.5 tackles for losses amounting to 19 yards. What we learned Saturday is what seemingly nobody wanted to admit. Alabama just has a better team than LSU by a large margin. Frankly, it probably has a better team than anybody in the country by a large margin. That’s a tough pill to swallow for any blue-blooded LSU fan, but after watching Saturday’s beatdown, there’s just no other conclusion to come to. A year ago, Orgeron famously said that LSU was “coming” for Alabama. Well, the Tigers learned the hard way that it’s not going to happen over the span of a year, especially not one when the Tide has a likely future Heisman winner at quarterback. Nick Saban has built a dynasty in Tuscaloosa over the span of a decade. It’s going to a take long and systemic change for the Tigers to finally topple that Goliath. If there’s one thing LSU fans should be happy about, it’s that Orgeron seems to know the problems, and he has a track record of learning from his mistakes. Nobody wants LSU to have that kind of success more than he does. It’s just a matter of if he can get the talent here and the job done. As LSU and its fans have been saying for nearly eight years now, maybe next year.